The career of Proflight Zambia’s youngest female pilot Besa Mumba has taken off after clocking up 1,000 hours of flying time. 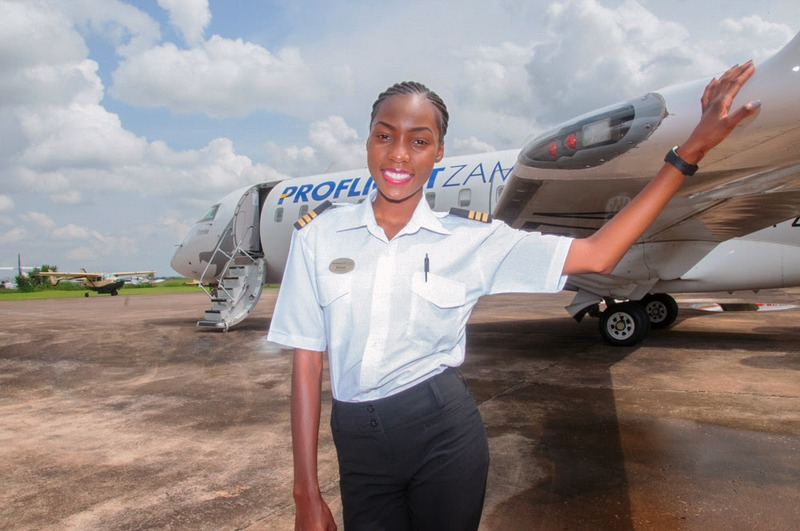 For the 20-year-old high-flyer, the sky is not the limit, following her recent achievement of becoming Zambia’s youngest commercial pilot with this latest milestone. After landing a job with the country’s favourite airline, Besa reached the 1,000-hour landmark recently while flying her Cessna Caravan aircraft on the Lusaka-Kasama route. The talented young aviator can now look forward to propelling her career by progressing and becoming a captain or taking the controls on bigger aircraft. Besa notes that any journey worth being on has its own challenges and the same can be said for flying, hence it is important to remain driven. “Being a pilot requires a lot of focus, paying attention to details; hence you need to have your full attention on your work. “I am happy I have come this far, it really motivates me to push to even more greater heights. “Today I am who I am because of my family and friends as they have always been there to support and motivate me in my dreams. Besa hopes she can inspire more females in Zambia think of becoming a commercial pilot in a career where men outnumber women by around 16 to one on the flight deck. Besa added: “The experience as a pilot has just been spectacular. I love my work, it’s taken me far and exposed me to many places around Zambia. “I have been flying as first officer pilot to lower Zambezi, Kasama, Livingstone, Mfuwe and Ndola, most of my frequent flights being along the Lusaka to Lower Zambezi route. “To everyone out there, a dream is achievable. Anyone can become what they dream to become. It’s difficult to verify her credentials because of nepotism & corruption in zambia. Flying a plane is one of the easiest things to do. Still can’t beat President Edgar Lungu’s flight hours, this chap has a very long way to go! By the way ba LT this is not a career website for such puppy articles, notify us when she is 50 years old and about to retire. Pwapwapwapwa! Sir Boston Gere. She can’t beat him for sho! Congratulations my dear! I am very proud of your achievements. The sky is the limit and you have a bright future ahead of you. Continue being focused and desist from negative sentiments. Well done young lady. Keep up the good work. So 1000/24 is like 42 days of flying and one makes news. I have over 10 yrs of work experience working between 8 and 12 hours a day for an average of 6 days per week. For simplicity’s sake, lets say 10 hours a day by 6 days that is 60 hours per week * 52 weeks in a year we have 3,120 hours. multiply by 10 years we have 32,120. I have clocked over 32,000 hours of work. why the hell on earth is she making headlines with only 1,000? I just wonder how zambians choose not to appreciate each other all you hear is say negatives about those who succeed, this is a terrible disease possessing our people , what is wrong with you poor zambians, you mean your own people can not do anything good! All you want is a foreigner to come and fly your planes that is rubbish too jealousy , this cancer is eating up most of zambians even in diaspora stop it it is stinking. You watch alot of wrong things. Do you even go to Church Mister? People blaming or despizing the achievement can’t even fly the cockroach in their pantd . border co-operation is vital as most of the customs offices are still in the Dark Ages. President please consider updating. Great achievement young lady at your age. Zambia is proud of you. Do not relent from jealousy or ignorant people. Keep on focusing to achieve greater things in your career. Then she is your sister! Congratulations girl! Don’t let Hajelousy people discourage you! “Flying is easy!” Wow! Typical responses of the average Zambian in this comment section. It’s poison. Champion young people achieving their dreams; especially those from your homeland. And to those wondering “why this is making news” – because at age 20, it is relevant to any young kid in Zambia who has a dream – whatever it may be. Your envy of other Zambians doing well puts you deeper into your darkened abyss of suffering. Let those with focus and a dream shine. What have YOU done today?